Keith Colacicco began his musical career as a 7-year-old when he performed the song “Wild Thing” on his electric guitar for classmates and faculty at his elementary school. The experience began a lifelong fascination with musical performance and an appreciation for the role that music can play in child development. Keith grew up in Huntington, New York, in a family that fostered creative expression in the arts. As a teenager, he studied guitar with industry professionals and played at local venues. A passion for the arts led Keith to the University of Southern California, where he studied both music and film. 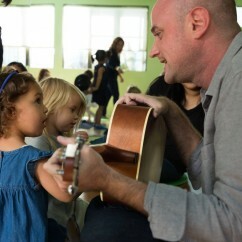 Keith has been teaching music classes at PLAY since January 2007, and can also be found playing music and hanging out at the beach in his adopted hometown of Venice, California.